Our Curatorial Advisor, Hilary Underwood, offers an insight into Watts's Sculptural Technique. The Sculpture Gallery at Watts Gallery is dominated by two huge white models for the sculptures of Tennyson and Physical Energy. These were the objects that the artist himself made: they were the originals from which bronze casts were made at a foundry at the end of the artist's life. Watts worked on Physical Energy for about 20 years when he was in his 70s and 80s. 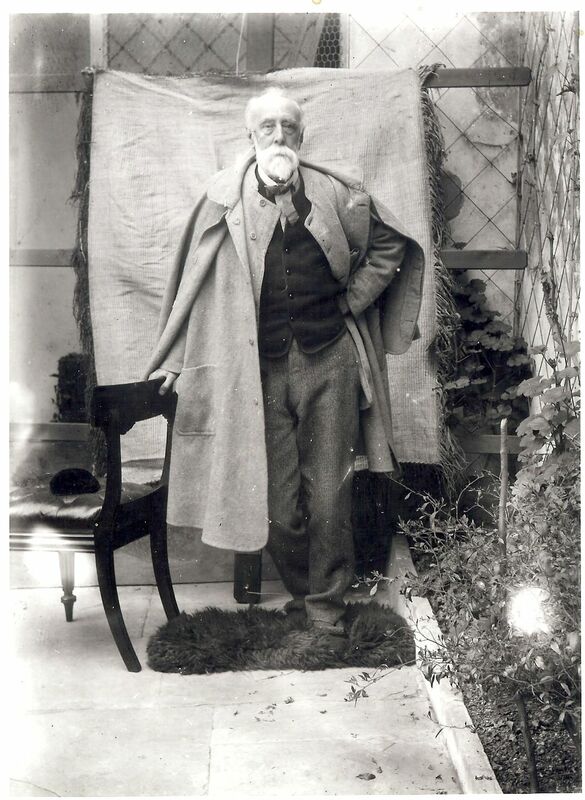 He started Tennyson in 1898 when he was already 81. How did the elderly artist create such massive sculptures? Obviously he had help. Successful artists like Watts have always employed studio assistants for routine tasks, but they rarely say much about it. Partly this was because it was taken for granted in an era which was used to employing servants and used to their invisibility, partly because of romantic ideas of original creativity. Large sculpture in particular needed a small workshop of assistants because of the heavy work involved. One of Watts's sculptural helpers from 1900 on was Thomas Wren. He later became the most talented modellers at the Compton Potters' Arts Guild and created the little effigy of Watts in the Cloister at Compton Cemetery. First Watts would create a small model of his design, to work out the composition and proportions. 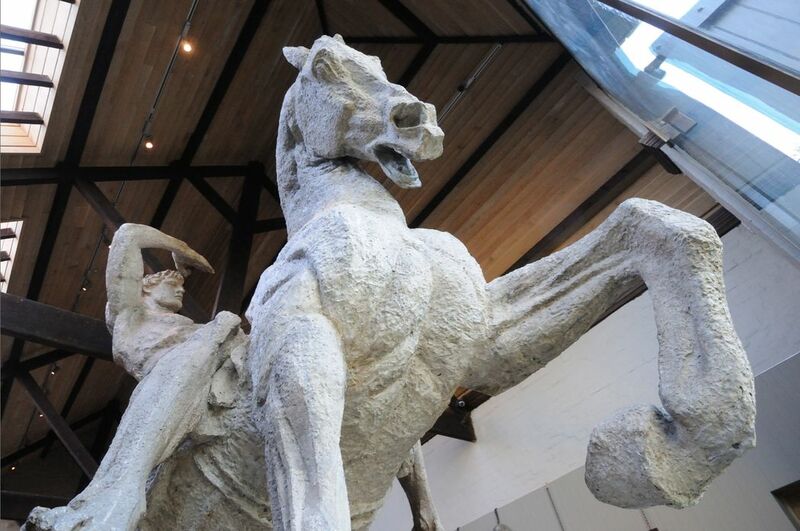 There is a metre high model of horse and rider in the sculpture gallery here. This is not for Physical Energy but an early idea for Watts's earlier equestrian sculpture, Hugh Lupus, made for the Marquis of Westminster to display outside Eaton Hall in Cheshire. This commission let Watts build a sculpture studio on the garden of his Kensington home which he then used for Physical Energy. Then his assistants would follow the proportions of the sketch and build a strong full size skeleton of wood and metal to support the weight of the final model. This armature would usually be hung with loops of wire and criss-cross pieces of wood to grip the modelling material better. A large photo in the Sculpture Gallery shows Physical Energy in progress with its original wooden supports. Watts had the internal armature of the legs made with joints so he could change their position as his ideas evolved. Spot the differences between this and the final version. If you look under the skirts of Tennyson's coat at the back (!) you can see ends of wooden and metal poles from the internal armature. Then Watts with his team would model the final sculpture. Usually Victorians modelled in clay, but this had to be kept damp with wet blankets while the sculpture was in progress to stop it drying and cracking. Think about doing that for 20 years… A friend of Watts once wrote that older painters he knew were always cheerful but older sculptors were miserable, which he attributed to rheumatism from the damp atmosphere. Watts was prone to colds and chills and an Italian assistant, Fabbrucci, introduced him to Gesso Grosso which he used for our big sculptures. This is a mixture of chalk, glue and fibre. It can be allowed to dry out, when you can carve into it or add more gesso – ideal for Watt's creative process. If you look at the surfaces of the sculptures, you can see traces of the brown fibre in the gesso. Watts did much of the modelling work himself. 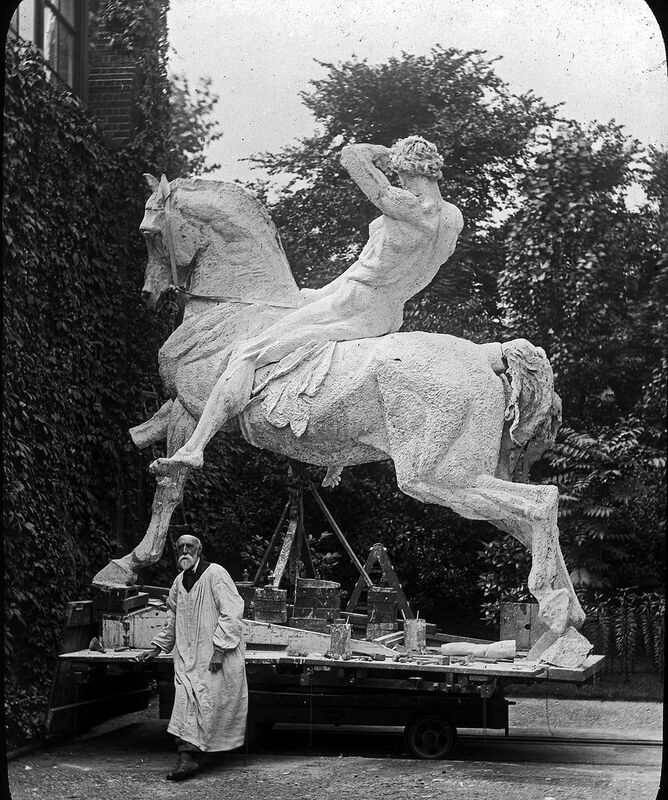 Despite his age, there are many photographs of him at work on the sculptures, balanced on tall platforms reached by ladders. It must have been a great wrench to him when his work was finally taken away to the Foundry.